DGL is an all-natural and pleasant way to sooth digestive irritations by stimulating a protective coating on the mucosal lining of the esophagus, stomach & intestinal tract. 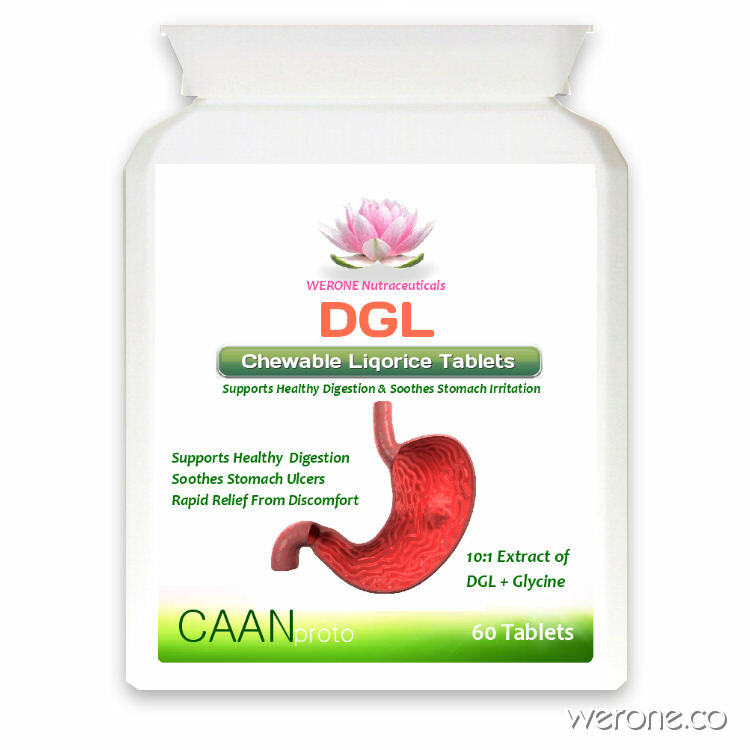 The two main areas DGL may support an improvement to health and wellbeing are: Barrett’s Esophagus: DGL stimulates the body to produce more mucous which could support the healing of duodenal and gastric ulcers. DGL may also maintain intestinal cell life and heal tissue damage. General stomach discomforts are also thought to be alleviated from DGL. Acid Reflux: DGL sooths the symptoms of heartburn and indigestion by decreasing the occurrences of reflux. DGL provides a protective coating to the lower esophageal membranes reducing the effect of excess acid on these sensitive areas. Use 1677 points to purchase this product! Liquorice has been used for thousands of years in Traditional Chinese Medicine as a tonic to rejuvenate the heart and spleen, and as a treatment for ulcers, cold symptoms, and skin disorders. It also has a long history throughout the world as a medicinal herb for numerous health complaints. Research is now proving that it does indeed have very potent therapeutic effects. Liquorice extracts protect the esophagus, stomach and intestinal lining from stomach acids. In cases of heartburn, Liquorice also helps repair the stomach’s protective mucous lining. In the following studies, two of the standard anti-ulcer medications failed to perform as well as Liquorice extracts. DGL also has a powerful anti-inflammatory effect and is very soothing to the upper GI tract. It has been comprehensively researched and shown to be an effective treatment for ulcers of the GI tract and also to prevent damage to the intestines by aspirin. The deglycyrrhizinated Liquorice version has the substantial parts of glycyrrhizin removed, therefore is a safer option for long-term use if needed. In a recent study at the Institute of Medical Microbiology and Virology, Kiel, Germany, researchers found that Liquorice extract produced a potent effect against strains of H. pylori that are resistant against clarithromycin, one of the antibiotics typically used in the three antibiotic treatment regimen. The authors concluded that this study provides hope that Liquorice extract can form the basis for an alternative therapeutic agent against H. pylori. DGL is an all-natural and pleasant way to sooth digestive irritations by stimulating a protective coating on the mucosal lining of the esophagus, stomach & intestinal tract. Barrett’s Esophagus: DGL stimulates the body to produce more mucous which could support the healing of duodenal and gastric ulcers. DGL may also maintain intestinal cell life and heal tissue damage. General stomach discomforts are also thought to be alleviated from DGL. Acid Reflux: DGL sooths the symptoms of heartburn and indigestion by decreasing the occurrences of reflux. DGL provides a protective coating to the lower esophageal membranes reducing the effect of excess acid on these sensitive areas. Twenty patients with aphthous ulcers were advised deglycyrrhizinated liquorice (DGL) mouth wash and were followed for two weeks. Fifteen patients experienced 50-75% improvement within one day followed by complete healing of the ulcers by third day. There is a God! This is It! Let me first of all tell you with everything I have got that I am not a seller of this just to believe my story. I have had this evil disease called pylori for 7 years now and was treated for pylori with a load of anti-biotics. My guts have been left with the problem that every single piece of food i now ever put in my mouth makes my insides feel like they are going to burst. This problem never goes away. I am left in this agony every single minute of every single day 7 days a week. I now look like I am 8 months pregnant aswell. The docs have tested again for pylori and said it was clear. Ive had an endoscopy and that shown excess acid and gas but nothing else. They have left my insides with some kind of permanent damage and I am no better off, I am depressed, suffer anxiety and have no life worth living really now. My problems now are actually worse than the pylori itself was. At least that came and went. Ive tried everything. Lanzoprozole, Zantac, pro biotics, mastik gum, every digestive enzyme on the market. changes in diet yakult multivits omniprozole. I’ve had wheat allergy tests. Celiac, lactose, bacteria overgrowth tests. The above have done absolutely nothing and the right inside of my stomach just under my rib feels like it has a constant itch inside it. Sugar makes it worse than anything. I have been taking this for about 4 days and my god. Its the only thing that has truly worked. I have never felt so happy and my stomach feels completely normal again. I still get full quite a lot after eating but it actually now feels like its full with food and not agonising bloated bursting air. I really have no idea what is inside this stuff but it works. The other thing that has gave me the same results as this is Mastic gum. But i’m not sure why or whether to take both or just try one at a time..